Elvish. We can't read it. And off you go. Bring us back the password. P.S. I'll show/explain the solution on the stream in ~two weeks. P.S.2. Bonus points for recreating the original high-level code. it has 7 constants: None, a long string of hex digits, the string 'hex', and numbers: 89, 255, 115, 50.
its flags are set to 67 (CO_NOFREE, CO_NEWLOCALS, CO_OPTIMIZED). This is the “standard” value that most uncomplicated functions take. There are two ways to solve this task: you can re-assemble the dis output with the help of the opcode module, or try to re-create the function by hand, using the bytecode. I chose the latter method. Let’s stop to look at the constants and names for a second. The long string is followed by hex, and one of the constants is decode. This means that we need to use str.decode('hex') to create a (byte)string of some information. Puzzle answers tend to be human-readable, and this string isn’t — so we need to do some more work. So, let’s try reproducing the start of the original mission code using what we’ve just discussed. Python’s VM is based on a stack. In the bytecode above, you can see that instructions take 0 or 1 arguments. Some of them put things on the stack, others do actions and remove them. Most instruction names are self-explanatory, but the full list can be found in the dis module documentation. Let’s take another look at our names. We can see we’re missing all, zip, ord. You can already see a common pattern here: we will iterate over both strings at once (using zip), do some math based on the character’s codes (ord), and then check if all results (of a comparison, usually) are truthy. We can now write the full answer. In the end, our dis.dis() output matches the mission text (except the removed values, but their IDs do match), our co_* variables are all green, and we can get to work on solving the puzzle itself! BINARY_* and ord disappeared from the new listing. You can see the modified code (which differs by two bytes) and solver output. I solved the extra credit part of the puzzle. The real aim of the puzzle was to recover the password — the text for which check_password() will return True. This part is pretty boring. I built a dictionary, where I mapped every byte (0…255) to the result of the calculation done in the check_password() function’s loop. Then I used that to recover the original text. The password is: huh, that actually worked!. What was that Paint thing about? Most of my readers were probably puzzled by the mention of Paint. Long-time viewers of Gynvael’s streams in Polish remember the Python 101 video he posted on April Fools last year. See original video, explanation, code (video and explanation are both Polish; you can get the gist of the video without hearing the audio commentary though.) Spoilers ahead. Python can import modules from a ZIP file (if it’s appended to sys.path). Some tools that produce .exe files of Python code use this technique; the old .egg file format also used ZIPs this way. BMP files have their header at the start of a file. ZIP files have their header at the end of a file. 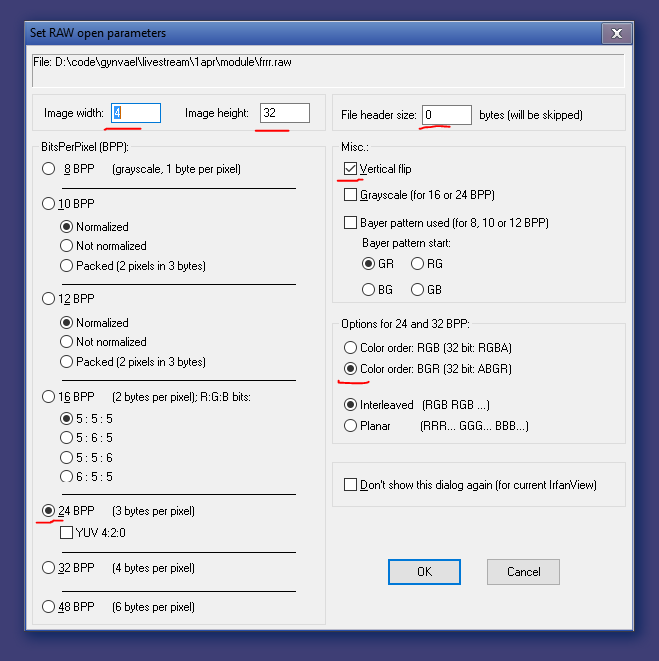 Thus, one file can be a valid BMP and ZIP at the same time. 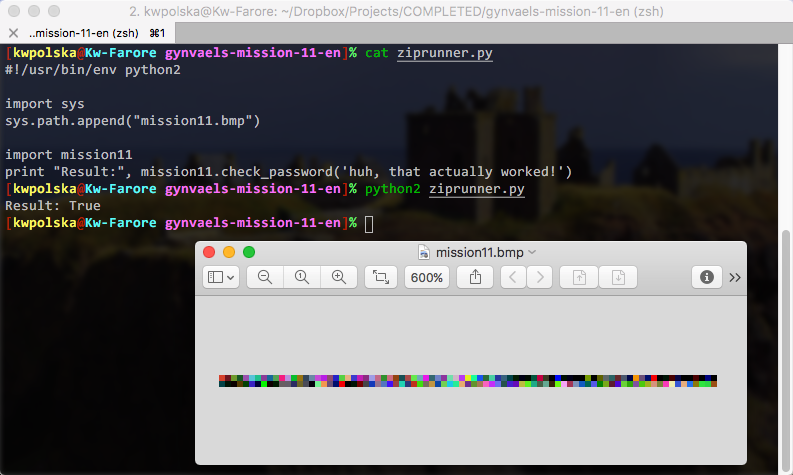 I took the code of check_password and put it in mission11.py (which I already cited above). Then I compiled to .pyc and created a .zip out of it. Thanks for the mission (and BMP idea), Gynvael!